In its quarterly report, Barnes & Noble expects revenue increases to be largely driven by sales of its e-reader devices and accessories, and by increases in children’s products and nonbook items. To that end, the company is investing most of its time and money on digital materials and readers—something all publishers and book retailers should be considering. Nov. 30 (Bloomberg) — JPMorgan Chase & Co. will give its investment bankers iPads to provide an additional mobile tool as Apple Inc. expands its domain to Wall Street, threatening Research in Motion Ltd. in a market it traditionally dominated. Nov. 30 (Bloomberg) — Research In Motion Ltd., the mobile- phone maker whose shares have surged since it unveiled a tablet computer to compete with the iPad, may sell fewer of the devices than investors project, said Susquehanna Financial Group. We already knew that the Kno, a tablet computer designed for college students, would be bigger and heavier than Apple’s iPad. It will also be pricier. Surf the web, take photos and get app-happy with Samsung’s Galaxy Tab. But please don’t call it an iPad. Samsung presents the Galaxy Tab, a new Android tablet with many features and a light touch. But it’ll cost you. 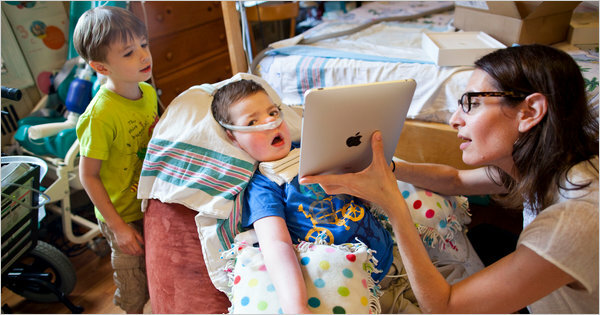 Here is an inspiring story and video from The New York Times about a boy with a degenerative disease that has been able to interact with an iPad. His mother says it is the first device that they have had success with and it is far cheaper than other devices they have tried. In addition, because the apps are inexpensive they can experiment to see which ones are the most beneficial. The article notes that there are studies in progress to determine how effective the iPad is for people with disabilities. In the months since the iPad has been on the market, it has already become a popular device for assisting the disabled but the usefulness of the device depends on the specific disability. In the coming months, we can expect that additional apps will be created and added to the app store to assist disabled users. There is a great, heartfelt video; watch it here. Electronic readers such as the Kindle and the Nook are among the latest tech devices many think will be favorites for shoppers this holiday season. Publishers Weekly studied traditional e-readers, tablet computers, and smartphones used to access electronic content. The list is a quick glance at each item with an image, price, and other details. Will print books survive E-Book takeover? AMAZON FRANCE CHIEF EXECUTIVE Xavier Garambois said prices of e-books should be 30% to 40% lower than those for print. A bill that will determine who sets e-book prices is working its way through the French parliament. WILL ELECTRONIC BOOK SALES climb to 15% to 20% of the market by 2015? That’s what a recent French study by Bain & Co. claims. The study says tablets such as the iPad will account for about two-thirds to three-quarters of total sales, while e-readers will account for the remainder. The study was conducted among 3,000 people in six countries: France, Germany, Japan, Korea, the United Kingdom, and the United States.